Many commentators have been expressing their views on the perfor­mance of President Magufuli during his first hundred days in office. There is widespread agreement that his crusade against corruption and related evils was overdue and that the President has become a popular personality both inside and outside Tanzania.
. the recurrent expenditure for the Vice President’s office dropped from TSh 31.5 billion to TSh 9.41 billion. After little positive action by the government for the last 40 years the new government has let it be known that it wants to fully move its seat of operations from Dar to Dodoma by 2020. The Prime Minister, Kassim Majaliwa, announced that he would move even sooner, by September 2016, and called on other ministers to do likewise. In a move to reduce corruption the government has planned to transfer all immigration officials at both main airports in the country to other posts and also transfer officials of the Passport, Accountancy, Residential Permits and Investigation Units at the Immigration Headquarters. The action of the new government in stopping the popular live broad­casts of the proceedings in the National Assembly because they were said to be ‘too expensive’ proved controversial. Zitto Kabwe, leader of the ACT Party, led the opposition and sought sus­pension of business to allow MPs to debate it in Parliament. However, a decision given earlier by the Steering Committee ruled that debate on the President’s speech could not be disrupted. Chadema MP Tundu Lissu, insisted that this went against the rules of the House by usurping the roles of the Chair and the Committee on Procedures. Amidst much noise and disturbance the riot police arrived and several opposition MPs were frogmarched out of the Chamber. Eventually the leader of the main opposition Chadema Party agreed to let MPs continue the debate on the President’s speech and asked the remaining opposition MPs to leave the chamber. tinued. They said that the decision was tantamount to censorship. Opposition parties offered to pay for the service, but their offer was rejected. There seems to be a widespread feeling in the country that broadcasts are a rare outlet where the relatively small but lively opposi­tion can hold the government to account and citizens can get an unvar­nished version of government matters being discussed by MPs. Instead of a full broadcast of proceedings, the parliament’s press team is now distributing selected highlights to TV stations at the close of each day’s session, according to press accounts. uploading the footage to social media. A 40-year-old man was sentenced to three years in jail or a fine of TSh 7 million ($3,100) after he was found guilty of insulting President Magufuli on his Facebook page. He admitted committing the offence. However, the court reduced the punishment after a plea by the lawyer of the accused. He will be required to pay a penalty of TSh 7 million in two instalments. If he fails to fulfil these requirements, he will serve the jail term. In a two-paragraph press statement in May, the President announced that he had revoked the appointment of Charles Kitwanga MP as Home Affairs Minister for coming to parliament ‘in a state of drunkenness’; he then arranged a minor cabinet reshuffle. The President said in June that the government had decided to tempo­rally freeze new employment opportunities in the public service, and to stop salary increments in a move to stamp out ‘phantom workers’ on the government’s payroll. He advised those aspiring for jobs in the next financial year to wait for at least two months so that the government could ‘end contradictions’ as it was struggling to clear out non-existent ‘ghost workers’ while the public service continued to recruit new staff. All permits for sabbatical leave were also stopped. President Magufuli declared that no executive in the public service should receive a monthly salary exceeding TSh 15 million beginning in the next financial year. He said it was a shame for a poor country like Tanzania to have people in public institutions getting TSh 40 million while those in junior positions received only TSh 300,000 a month. The Chadema Party has appointed a new Secretary General – Dr Vincent Mashinji (43). In his first address he said that he wanted to mobilise the members to fight for a new party constitution. He said he had chosen to abandon medicine and venture into active politics. He would aim for the party to ‘occupy the State House by 2020’. Chadema also announced their intention to hold a “day of defiance” with a series of nationwide protests on September 1st, 2016, denouncing what they described as President Magufuli’s “dictatorial” attitude to the opposition, notably a ban on politicians holding public rallies. The police have banned the demonstrations, on the grounds of national security and protecting the peace. However, Chadema leaders insisted that they intend to go ahead regardless, noting that the ban on the pro­tests was further evidence of the government’s heavy-handed restric­tions on opposition party activities, freedom of assembly and freedom of speech. Other complaints relate to the arrest of some opposition politicians and journalists for “sedition”, the closure or suspension of several media outlets, and clampdowns on online freedoms. STOP PRESS: Amid rising tensions, Chadema leaders postponed the Sept 1st protest hours before it was due to start, partly in response to offers from religious leaders including the Revd Anthony Lusekelo to mediate the crisis. Prime Minister David Cameron hosted a landmark international Anti-Corruption Summit in London in July which was attended by repre­sentatives from 40 countries. The UK Government had applauded the strong anti-corruption drive by the Tanzanian government and invited President Magufuli to participate. However, he had a prior engagement in Kampala at the inauguration of Ugandan President Museveni for another term in office. He sent a strong delegation to London led by Prime Minister Kassim Majaliwa. Apparently only one other African country was invited to the summit: Nigeria. The meeting agreed the first ever ‘Global Declaration Against Corruption’, and those present committed themselves to work together to expose, punish and drive it out. The Summit Communiqué stated that “no country is immune from corruption and governments needed to work together, and with partners from business and civil society to tackle it successfully”. The Communiqué included concrete actions aimed at exposing corruption; punishing the corrupt; supporting those who have suffered and driving it out. In addition to the Communiqué, countries made specific commitments in their country statements. A new partnership between Tanzania and the UK’s National Crime Agency was launched to share expertise in audit, financial regulation and anti-corruption investigation. The UK Crown Prosecution Service agreed to assist in establishing Tanzania’s Special Anti-Corruption Division of the High Court. The UK Department for International Development agreed to support Tanzania’s institutions of accountabil­ity, including the PCCB and the National Audit Office. The visit by President Magufuli in May to Rwanda attracted large friendly crowds. At the same time a first ‘Tanzania-Rwanda Trade Forum’ was held in Kigali. It lasted for a week and has apparently sweetened relations between the two countries. 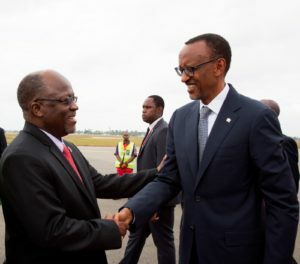 It also gave Rwandan President Paul Kagame the chance to call on Tanzania to do something about the theft of Rwandan minerals being exported via Tanzania to the outside world. Dar es Salaam remains the main port for land-locked Rwanda, handling 70% of the country’s imports and over 90% of its exports. Tanzania has installed cameras and boosted security at the port. Rwandan traders who were not allowed access to the container station now have complete access. Rwandan minerals are stored in a special parking zone and transporters are also allowed access to the yards where the containers are held. Minerals are escorted by armed security personnel from the time they arrive to the time they leave the port. According to a spokesperson of the Ministry of Foreign Affairs and East African Co-operation, the recent action amongst East African states to stop human trafficking of young women between 18 and 24 years old, who are seeking work in the Far East and Middle East, is not working properly. After imposing restrictions on Tanzanian jobseekers at all Tanzanian International Airports, a syndicate of human traffickers began arrang­ing flights of young girls through Kenyan and Ugandan airports. Between March and May, Tanzanian embassies in India, Malaysia and Oman made efforts to repatriate girls who had been forced to work in brothels. In Britain, newly appointed Prime Minister Theresa May indicated that she wanted to give top priority to stopping human trafficking world­wide. 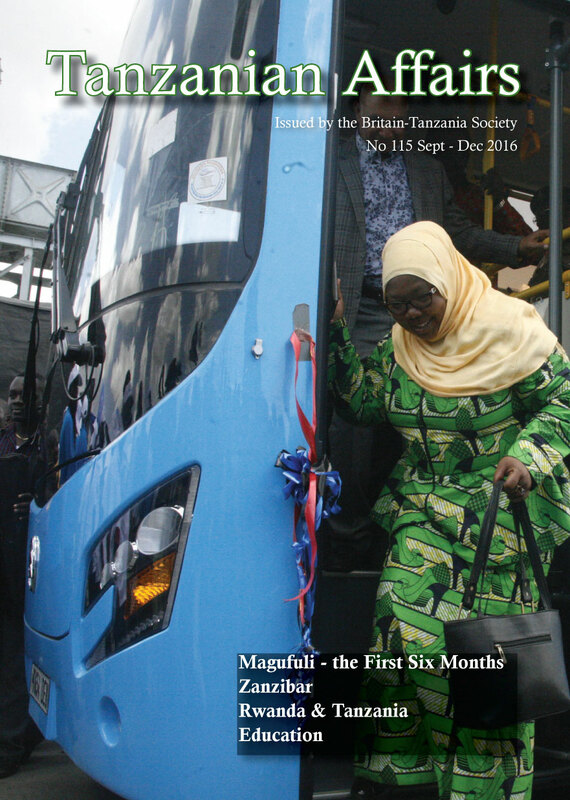 The result of Britain’s decision to leave the European Union caused sur­prise and some consternation in Tanzania. Bank of Tanzania’s Governor Benno Ndulu said that Brexit was likely to affect markets but it was a bit early to say and they were following developments very closely. After the independence of Zanzibar in 1964 and the subsequent violent revolution, a pattern was established under which the Zanzibar government was re-elected every five years. There were only two significant parties – the ruling CCM or ‘revolutionary party’ which was the majority party in the main and larger Unguja island and the only significant opposition party – the Civic United Front (CUF) which always won a few seats in the House of Representatives in Unguja but had overwhelming support in the other smaller island of Pemba. Zanzibaris tend to take elections very seriously and the atmosphere during elections is usually intense. In each election a few incidents of violence were witnessed. The CCM won each time, usually with a very small majority and always with complaints from CUF that the CCM had rigged the elections. After the elections of 2010, the two parties finally came together in a ‘Government of National Unity’ which reduced much of the interparty animosity. However, during the largely peaceful 2015 elections, the Zanzibar Electoral Commission (ZEC) suddenly stopped the counting of votes saying that there had been irregularities, especially in Pemba. Both sides claimed to have won [see TA 113 and 114]. The CCM then said that there would be another election on March 20th 2016. CUF decided to boycott this and were joined by a group of very small parties. CUF wanted the results of the previous (2015) election to be accepted. In the second election the number of people voting was only about 15% of the electorate and CCM got an unprecedented 91% of the vote. Nine out of 14 small parties joined CUF’s boycott. Another new feature was that three smaller, previously hardly known parties, won seats and subsequently supported the CCM in the Zanzibar House of Representatives, enabling it to claim an element of legitimacy for a continuation of its rule. The CUF delegation with Seif Sharrif Hamad (second left) and Ismail Jussa (third left) arriving at Dules airport Washington DC on June 11. It said that it was going to file a case at the High Court against the Inspector General of Police and the Minister for Home Affairs for what it termed as ‘atrocities committed by police and other security organs against its supporters during the election’. Taking journalists through the report, CUF’s Acting Director for Human Rights, Ms Pavu Juma Abdallah, said that more than a thousand people had been directly affected by the ‘atrocities’ which she said had been committed during the election campaign. She added that it had all started on March 24 last year, when a CUF office in Dimani was torched. Five days later a militia attacked CUF supporters on their way from a rally in Makunduchi. A number of CUF supporters were said to have fallen victim to a wave of attacks including from uniformed police officers and other security operatives, which left six people with gunshot wounds. According to her, the data that CUF collected from the ground indicated that 300 people had been arrested by security officials. Some hundreds were said to have been beaten, 70 houses belonging to CUF supporters were destroyed. CUF said that it would use these figures to speed up the pro­cesses of helping The Hague-based International Criminal Court (ICC) to open investigations against “all those who perpetuated the atroci­ties.” CUF intends to send evidence to President Magufuli, and all local and international human rights organisations to give them a first-hand account of the alleged abuses. 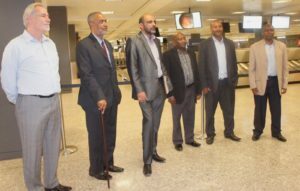 In July-August, there was a visit by a CUF delegation, led by Secretary General Seif Sharrif Hamad, to the USA, Canada, Britain and other European countries to explain the dangers which might lie ahead. He repeatedly warned of unrest in the isles if the present situation contin­ued; Radicals would find an opening in Zanzibar, an archipelago with a 98% Muslim population. Zitto Kabwe, MP for Kigoma and the leader of the small opposition ACT-Wazalendo Party, told The African Report that Zanzibar was “boiling”. There was is no legitimate government in Zanzibar and “I am worried that people will go to the streets”. Many political analysts said that leaving CUF, which had been a pow­erful opposition force in the past 20 years, out of politics, could have serious repercussions on democracy and peace. A statement issued by 16 high commissioners and ambassadors to Tanzania, condemned the ZEC decision to annul the Zanzibar election. The European Union clearly had some difficulty in reacting to the Zanzibar election results. Eventually it decided to maintain minimal contact with the government of Zanzibar’s President Ali Mohammed Shein because of the decision of the ZEC to annul the election results without providing evidence to justify “this unprecedented decision”. The second election was boycotted by 9 out of 14 political parties, which had participated in the November 2015 poll. Nape Nnauye, the ruling CCM party’s Publicity and Ideology Secretary, said that his party would go to the second polls regardless of any boy­cotting because ‘not all political parties have been fielding candidates in every election’. The implementation of a new Tanzanian constitution has been left in limbo since April 2015 when the draft constitution was supposed to be put to a national referendum. 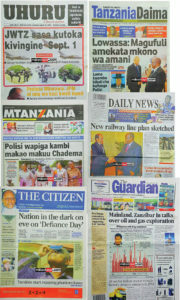 We now have some news which suggests that there is still a possibility that Tanzania will have a new constitution. President Magufuli announced on 23rd June that the government would ensure that the constitution making process would continue where it left off and that the final draft “Katiba” would be presented to the nation in the refer­endum. This move has surprised many observers, who thought that the govern­ment had given up on passing the largely controversial and divisive draft. There had been suggestions that the government would go back and arrange for a further redraft of the constitution which would look more like the previous draft created by the Warioba-led Constitution Review Commission (CRC). There has been no date given for the referendum and so it is not yet certain that it will take place this year, if at all. However, the longer the process takes, the more criticism and opposition the current draft constitution will face. This in turn will make it less likely that it will be voted for. Already Joseph Warioba has warned the government that its attempts to stamp out corruption would be difficult without a supportive constitu­tion, and that some sections of the previous draft, now removed, con­tained provisions which could be used in Magufuli’s war on corruption. Regarding democracy, veteran political journalist Jenerali Ulimwengu has been more outspoken and is quoted as saying, “Despite the actions that President Magufuli is taking and has been commended for, if you look at the bigger picture we have now gone back 50 years in democracy issues…..He (Kikwete) should come and explain ….if former ministers were taken to court for causing a loss to the government, Honourable Jakaya Kikwete should also be taken to court to answer charges for occasioning a huge loss to the government and destroying the hopes of citizens…by failure to get a new constitution”. It is only a matter of time before Chadema and other opposition parties start attacking the government on constitutional matters. Magufuli is between a rock and a hard place. The current draft constitu­tion has cost over TSh 116 billion (around $50 million) and counting. To go back and make further amendment will only add to the huge cost and will not guarantee a new agreed draft. To do nothing would be to waste the money spent so far. To push ahead with the current draft will antagonise the opposition. It is well known that the President does not like to waste money. We therefore wait for news of a referendum. Fifty years ago Tanzania was the biggest producer of sisal in the world – some 300,000 tons per annum. Much of the landscape in Tanga Region and parts of the then Central Region was dominated by huge estates, often owned by private individuals or companies, under the manage­ment of Asians, Greeks and other Europeans. Most of the very hard work on the estates was done by thousands of contract labourers from Rwanda and Burundi. Sisal is a species of agave native to southern Mexico but widely culti­vated in many other countries. It yields a stiff fibre used in making rope and twine, and now has many other uses including paper, cloth, wall coverings, carpets, and dartboards. The industry largely collapsed in the fifties when Tanzania’s socialist government nationalised virtually all but one of the estates (Amani), there was a rapid expansion in the use of combine harvesters interna­tionally (sisal twine was no longer needed) and artificial substitutes began to be manufactured at lower cost. The Greeks returned home. Then, in this century, the industry began to revive slowly as demand increased and new uses were found for the fibre. The government has now set new production targets and planting has started again. Yunus Mssika, Senior Quality Assurance Officer at the Tanzania Sisal Board (TSB) announced recently that the country planned to increase production to reach 100,000 metric tons by 2021. All this is part of a 10-year Sisal Crop Development Plan started in 2012 aimed at increasing production of various sisal products, to increase uti­lisation of the sisal plant, to increase the country’s export market share, to undertake research and development of products and markets and to increase the participation of smallholder and out-grower farmers in the industry. The plan envisages putting in place biogas plants that will produce fuel for electricity generation on 14 estates. According to the latest available statistics from the UN Food and Agriculture Organization (FAO), in 2013, global production of sisal reached 281,000 tons – 53% were produced by Brazil, 12% by Tanzania, 9% Kenya, 6% Madagascar and 5% by China. Currently a ton of sisal trades between $1,900 and $2,200. Prices have stabilized since 2010, fol­lowing increased investments in the crop in Tanzania. Following a major upheaval in the sugar market during recent months and evidence of many questionable practices, the existing private sec­tor sale monopoly (controlled by a small group of people known as the ‘sugar barons’), President Magufuli’s government has taken over control of all sugar imports into the country – mostly from Thailand, Brazil, India and Indonesia. The result was, inevitably, a rise in prices, and serious shortages soon developed. The President has also launched a major enquiry into the industry, espe­cially into patterns of consumption and the extent of illegal smuggling to avoid tax. The Tanzania Sugar Board quickly arranged for the importation of 12,000 tonnes of sugar to relieve the shortages. It seems the basic problem is that Tanzania is not producing enough sugar to satisfy local demand. This stands at 420,000 tonnes per year while local production was only 304,000 tonnes in 2015. In a further development Minister for Agriculture, Mwigulu Nchemba, announced that the government had set aside 294,000 hectares to be allocated to companies looking to develop sugarcane plantations. The Minister said that the land would be allocated to investors through a tendering process, to be coordinated by the Tanzania Investment Centre. In the light of this, Oman’s Minister for Industry and Trade visited Tanzania recently to lobby for his country to be given permission to invest in the establishment of new sugar estates and put aside a sum of up to $25 million as capital. In late May the government banned the export of wild animals outside the country for the next three years, until proper procedures can be put in place to ensure that only approved animals are transported. Following a long period of destruction of forests and poor agricultural practices exacerbated by recent heavy rains, the level of water in Lake Victoria is reported to have risen by a metre. Over-fishing and oxygen depletion are said to be threatening its biodiversity with more than 200 indigenous species facing possible extinction. The members of the Lake Victoria Basin Commission, at a recent meeting in Entebbe, Uganda, studied ways in which these trends could be reversed. The country is in the process of conducting a nationwide audit to identify undeveloped parcels of land exceeding 50 acres with the aim of repossessing them. Minister for Lands, Housing and Human Settlements, William Lukuvi, said recently that ownership of idle land would be revoked and the land reallocated as part of wider efforts to end long-standing land disputes and ensure equitable distribution. In early July Prime Minister Kassim Majaliwa announced a ban on ‘shisha smoking’ in the country and asked clerics, parents and leaders to fight against dealers and smokers. All places that sell shisha were to be closed. ‘Shisha’ is a molasses-based tobacco concoction smoked in a water pipe known as a ‘hookah’. The directive was issued at the Khoja Shia Ithnasheri Mosque in Gandhi Street in Dar es Salaam. He said that shisha was killing the future of the country by wreaking havoc on the mental health of young people. The smoking habit has been gaining popularity among the youth with many believing that it is less harmful than cigarettes. Research conducted by the World Health Organisation (WHO) however, estimates that the volume of smoke inhaled during an hour long session is equivalent to smoking between 100 and 200 cigarettes. In June scientists from the UK (Oxford and Durham Universities) and Norway announced the discovery of a large reserve of helium gas in the geo-thermally active Tanzanian Rift Valley. Their study estimates a probable helium reserve of 54 billion cubic feet in just one part of the Rift Valley, enough to satisfy global consumption of the gas for nearly 7 years. This is an exciting find – described as a “game-changer” – since global helium supplies are running out and the price of helium has risen by 500% over the last 15 years. Helium is the second most abundant element in the universe but is exceedingly rare on earth. It is used in specialist applications like hospital MRI scanners, super magnets, particle accelerators, military equipment and spacecraft. The scientists believe there is enough helium in this one Rift Valley location to fill at least 1.2 million MRI scanners. The find is bound to intensify exploration efforts in the Rift Valley. Tanzania believes that the prolonged fall in oil and gas prices represents an opportunity (for gas-driven development), rather than a threat, and in June convened a meeting between the country’s gas discoverers – Statoil, Exxon Mobil, Ophir Energy, Shell and TPDC – to start framing possible commercial and technical terms to govern the planned onshore liquefied natural gas (LNG) export terminal at Lindi. The parties have yet to take a decision on the huge investment and those terms – to be defined in a Hosting Government Agreement (HGA) – will be a vital consideration influencing it. Government has allocated 19,000 hectares of land in Lindi for the LNG export terminal and its associated industrial infrastructure. In February 2016 Shell acquired the BG Group (with assets valued at $55 billion) in the world’s biggest energy deal in a decade. Importantly, the deal gives Shell a majority stake in BG’s gas discovery blocks in southern Tanzania and hence a substantial interest in the planned LNG project. For Tanzania the deal offers access to Shell’s worldwide experience, technology, networks and markets for the country’s gas. However, the government and Shell are apparently now in dispute over the amount of capital gains tax (CGT) that should be paid on the sale of the BG Group’s Tanzanian assets. It is reported that the Tanzanian Revenue Authority (TRA) is seeking US$520 million in CGT, an amount that Shell rejects and it has appealed to the tax tribunal. Sensitive discussions are still ongoing but there is concern that a lengthy dispute could delay the LNG plant. TPDC has announced that the company to be formed to raise funding, procure goods and services and then to operate the oil export pipe­line between Kabale in Uganda and Tanga Port will be known as the Pipeline Company (PIPECO). The stakeholders in the pipeline are the governments of Tanzania and Uganda and the three companies that have made the oil discoveries in Uganda: Total (of France), Tullow Oil (of UK) and the China National Offshore Oil Corporation. Details of the likely pipeline costs, timing and throughput were given in TA114. Information subsequently released includes the pipe’s routing in Tanzania (it will pass through Kagera, Geita, Shinyanga, Tabora and Singida to Tanga), the expected funding arrangements (the stakeholders will provide 40% of the funding and PIPECO will raise 60% in loans) and that Uganda will be charged a transit fee of just over $12 for each barrel of crude transported. Contract negotiations are ongoing. A final investment decision is expected by mid-2017. Meanwhile, the Tanga Regional Commissioner has urged farmers to start planning the expan­sion of their fruit, vegetable and poultry production in anticipation of the increased demand that the pipeline construction and operation will generate. TPDC also announced a new joint venture between itself (holding a 20% stake) and three companies from Germany, Denmark and Pakistan to establish a gas-powered fertiliser manufacturing facility at Kilwa Masoko in Lindi Region. The plant will produce 3,850 tonnes daily for Tanzanian farmers and also for export. It will also create jobs in the region. TPDC has begun the process for compensating the small num­ber of residents who have encroached on the 820-acre site that it has owned since 1989 – when plans for a similar KILAMCO project were first developed as the primary use for Songo Songo gas. (That project was shelved because of TPDC’s inability to raise enough equity finance and also because of concerns about the project’s long-term viability given the world surplus of fertiliser). In a move to expand significantly the number of vehicles in Dar beyond the current 40 that are powered by compressed natural gas (CNG), TPDC will build five more CNG fuelling stations in the city. Presently there are only two CNG points, at Ubungo and at TPDC’s Mikocheni estate. CNG is much cheaper, cleaner and healthier than using petrol and diesel but the initial vehicle conversion cost is high. 2.5 million rural Tanzanian households to be connected to the national grid. The programme will also help increase the number of small renewable energy projects in rural areas, providing power to homes and businesses. In 2014 nationwide electricity connectivity was 36%. The government aims to increase this to 50% by 2025 and 75% by 2033. A report by the Tanzania Extractive Industries Transparency Initiative covering 2013-2014 reveals that 13 big mining companies have not paid any corporate tax since they began mining operations in the country. The companies cite as reasons their accumulated losses resulting from high prior-year mining expenditures as well as tax holidays allowed under Mining Development Agreements. “No corporate tax has been paid because no corporate profits have been earned” said one company executive. They also say they have paid mining royalties and certain other mining taxes. However, President Magufuli has recently questioned why foreign mining companies who claim they have not made a profit for years are still hanging around an unprofitable mine. Perhaps things are changing, though. The Tanzania Mineral Audit Agency signals an improved scenario for 2015, with major mines having paid almost US$50 million in corporate tax. Under the Norwegian aid programme the government has benefited over the last three years from capacity-building support in the specialist areas of petroleum and mineral taxation. This has helped TRA reduce the declared losses of major mining companies. The Deputy Minister of Energy and Minerals, Medard Kalemani, told Parliament in Dodoma that his Ministry had opened offices in most regions of Tanzania so as to take its services closer to small-scale miners. He also said that such miners will benefit from TSh 6.8 billion in subsidies next financial year. Meanwhile, regional authorities in Geita have revoked 132 licenses of small-scale miners for failure to comply with mining laws (including non-payment of royalties) and have warned more may be revoked. 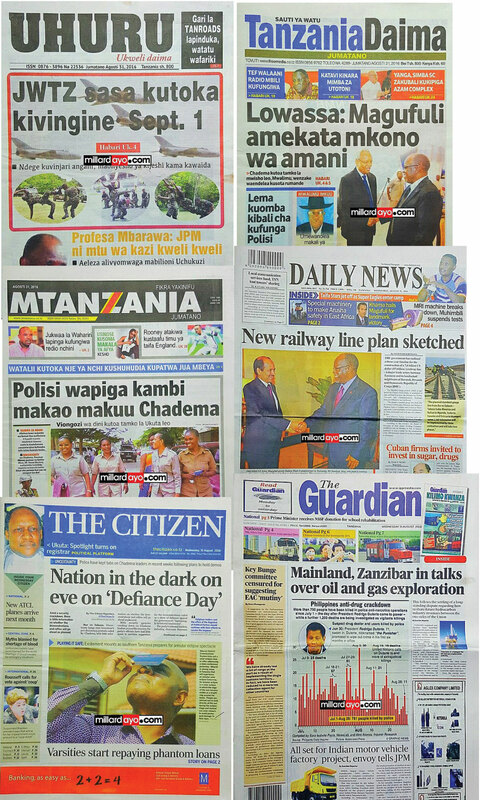 This June a familiar shadow fell across Tanzania’s tourism industry. For the past few years, in the run up to the annual budget, the Tanzania Government has threatened to remove the VAT exemption that previously applied to many aspects of the tourism industry’s goods and services. And every year, following a good argument and representations from tourism players to the highest levels of government, the threat has fallen away. Until this year. As reported by Hugh Morris in The Daily Telegraph on 7th July, on 23rd June, Tanzanian tourism operators were notified by the Ministry for Natural Resources and Tourism that the exemption would be removed from 1 July. The reaction from tourism operators was immediate as representatives of the industry pushed behind the scenes and in public for the government to reassess its position, citing the potential harm the changes will cause to the Tanzanian tourism industry and the potential result of making the country and uncompetitive and unattractive destination for long haul tourists. The East African on 18th June contained a statement from the 330-member Tanzania Association of Tour Operators (TATO) that said the country was already charging 7% more than other regional states due to multiple taxes and that imposing the proposed VAT would cripple the $2 billion worth industry. Going onto explain how tour operators in Tanzania are currently subjected to 32 different taxes, 12 being business registration and regulatory licence fees, 11 annual duties for tourist vehicles and nine other miscellaneous fees. to indicate that the government would consider a compromise and reports began to circulate of leading industry figures considering approaching President Magufuli to plead their case. If these stories suggested a conclusion to the story (for another year), they were wrong. On 19th July, the Citizen reported how President Magufuli used an address to newly promoted police officers to scotch any rumours of compromise and reiterated that all charges due must be paid saying that it was better to have 500,000 tourists who paid the correct charges, rather than 1,000,000 who do not. President Magufuli has made probity and clarity of procedure the mark of his nascent presidency and his comments are understandable in that context. However, it is also not difficult to understand the frustration of all Tanzanians working in the highly competitive African tourism industry. They know that the Okavango Delta or the Maasai Mara, to name but two, have as much draw as the Serengeti or the Ngorongoro Crater to many tourists who still regard Africa as a single country. The costs of going on safari are rising across the continent and so the end price of a package is assuming ever-increasing importance. The fear is that Kenya, which recently restored the VAT exemption on various tourism goods and services, will take a painfully large slice of tourist pie that had, until this year, been feeding so many Tanzanians. A declining Tanzanian tourism industry will have three potentially serious consequences. The first consequence will be a significant drop in foreign currency earnings that will directly impact the national finances. The second will be loss of jobs as drivers’ services go unrequired and camps close. The third will be a setback for the cause of Tanzanian wildlife conservation – still, itself, reeling from the horrendous poaching epidemic of the last few years. In many parks and reserves it is only the presence of camps and the tourists they attract that protects these vital areas from poaching, habitat loss and unrestrained development. If camps don’t attract tourists then they become financially unviable and close, leaving the land vulnerable. It is therefore understandable that many in the Tanzanian tourism and conservation sectors are despondent, but they are also frustrated, asking themselves why impose a new tax when so many existing ones go unpaid by so many? Health sector analysts and advocates took issue with the 2016/17 budget of the Ministry of Health, Community Development, Gender, Elderly and Children, as tabled by the Minister, Ummy Mwalimu, in parliament. The budget totals TSh 845bn (£300m), of which TSh 518bn was allocated to development expenditure and TSh 278bn for recurrent costs. This represents a small overall increase on the Ministry’s 2015/16 budget, which totalled TSh 785bn, but analysts pointed out that under President Magufuli, two Ministries had been incorporated into one, with the Ministry of Health and Social Welfare having been merged with the Ministry of Gender, Women and Children. The executive director of Sikika, a local health advocacy NGO, Irenei Kiria, said the budget would not help tackle a number of challenges facing the sector including shortage of drugs in health facilities. “The budget is not enough to significantly cut the drug shortage. The minister says TSh 251 billion from the development fund have been allocated to purchase medicine and other medical supplies but we should remember that the ministry also owes the Medical Stores Department about TSh 131 billion,” he said. Meshack Mollel, the Advocacy and Resource Mobilisation manager for UMATI, an NGO dealing with sexual and reproductive health education, information and services, challenged the government to meet the Abuja Protocol that requires every country under the agreement to allocate at least 15% of its annual budget to the health sector. This means the budget should have been about TSh 4 trillion. “In this budget we should not expect any big things in the health sector,” he said. Gloria Shechambo of the Tanzania Gender Network Program (TGNP) praised the decision to allocate more funds into development projects than the recurrent budget, but added that the key challenge was the timely release of funds by the Treasury. “The government’s plans to offer to Tanzanians universal health coverage should prompt improvement in financial allocations to the sector, otherwise the plans will remain a far-fetched dream,” she said. The first ever heart bypass surgery in East Africa has been conducted in Tanzania, at the Jakaya Kikwete Cardiac Institute (JKCI). 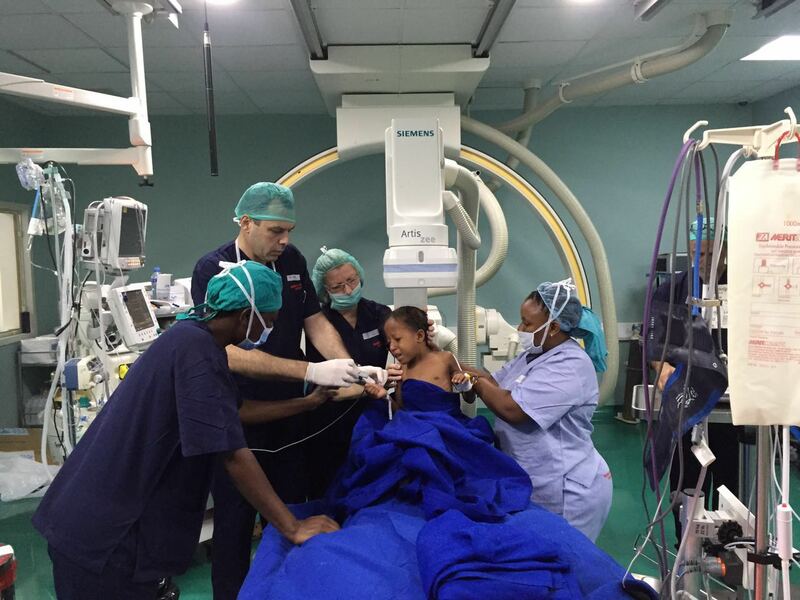 A visiting team of doctors from BLK Hospital in New Delhi, India, and doctors from JKCI carried out the two-day joint exercise in May 2016, according to Head of the Cardiology Unit at the JKCI, Dr Peter Kisenge. Dr Kisenge told a news conference in Dar es Salaam that in those two days, his institute would help the country to save TSh 180m, the amount that would have been spent if the 18 patients had opted to travel outside the country for treatment. “Performing a heart by-pass surgery costs TSh 27m for a single patient abroad and if a patient decides to undergo such surgery in Tanzania, he/ she will have to pay between TSh 8m and TSh 10m’’ he said. 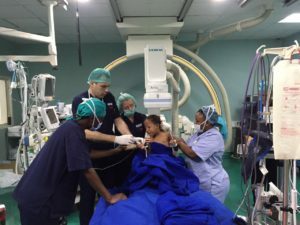 The Indian hospital will provide training to doctors from Tanzania in New Delhi, and will regularly send teams from India to Tanzania to work with cardiologists at JKCI and to perform complicated surgeries. “We are optimistic that the Tanzanian doctors will be able to learn more from us as we will similarly be able to learn as well from them through this partnership,’’ said Dr Subhash Chandra, the Chairman and Head of Cardiology Heart Centre at BLK Hospital. Previously the JKCI carried out surgery using a heart lung machine that requires cardiologists to stop patients from breathing until the process is completed. Tanzania has failed to meet targets set in 2011 to control and pre­vent chronic and non-communicable diseases (NCDs), according to a new report by the Tanzania Non-Communicable Diseases Alliance (TANCDA). The missed targets include a 25% reduction in risks of premature mortality from cardiovascular, cancer, diabetes and chronic respiratory diseases, and a 30% reduction in tobacco use. TANCDA Chairman, Dr Tatizo Waane told The Citizen that Tanzania has failed to meet the targets because NDCs receive fewer resources. Thousands of university students have been expelled, after a review found that they did not possess the correct qualifications for admission to their courses. 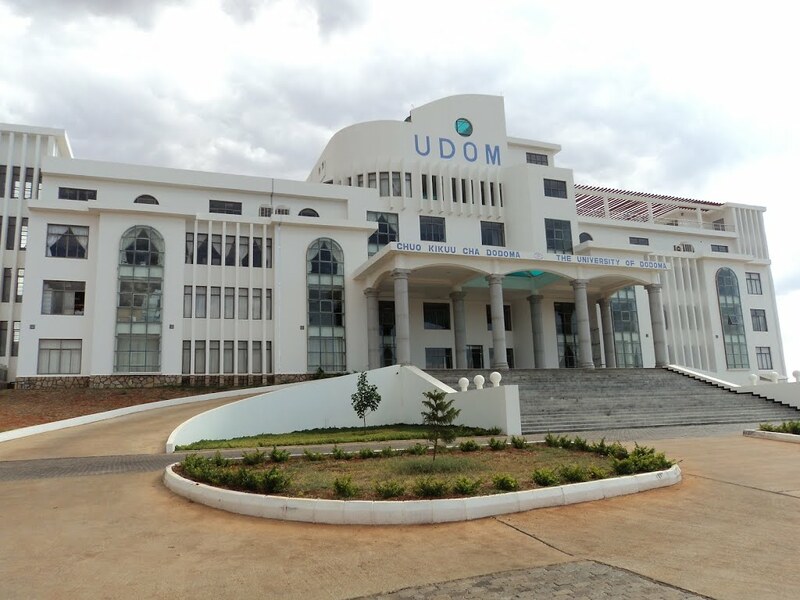 In one case – the University of Dodoma (UDOM)’s special teacher training diploma course – over seven thousand students were expelled in a single day, leaving just 382 students in place on the course, less than 5% of the original number. The Minister for Education, Science, Technology and Vocational Training, Prof Joyce Ndalichako, explained that a vetting exercise had established that the 382 students allowed back were the only ones who were actually qualified for admission to the university’s special diploma. The rest had been wrongfully enrolled, she added. “Since the (admissions) review established that 382 students passed at least two science subjects with divisions I and II … these are the only students who will be allowed to re-join UDOM and complete their studies at the university,” she said. The special teacher training program was aimed at reducing a shortage of science, mathematics and technology teachers countrywide. 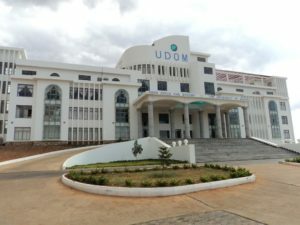 The chairperson of the University of Dodoma Academic Staff Association (UDOMASA), Edson Baradyana, was critical of the government move to expel the students. He put the blame on the government officials who spearheaded the teacher training programme. “This was the government’s plan from the outset and they stated the required qualifications for admission to the programme, so the university should not bear the blame,” he said. According to Baradyana, there could be some confusion over the grading system used by the government team that carried out the verification exercise. He suggested that those enrolled in first year were admitted using GPA qualifications, but the government had since reverted back to the old division system. He added that since he had been personally involved in the initial admission process, he could vouch for it. He added that government officials previously did not listen to warnings from UDOM academicians that the teacher training programme was flawed in the first place. Earlier, it had emerged that 1,000 O-level students were wrongfully enrolled to pursue undergraduate degrees over the past two to three years without passing through A-level education. The parliamentary Social Development and Services Committee announced in the National Assembly that the students were admitted to various universities and colleges in the 2013/2014 academic year contrary to admissions guidelines issued by the state-run Tanzania Commission for Universities (TCU). This news came just a day after President John Magufuli disbanded the TCU’s governing board and sacked or suspended several top commission officials over a related student enrolment scam discovered at the privately-owned St Joseph University in Tanzania. 489 students from St Joseph’s were expelled as a result. The scandal also spread to the Higher Education Student Loans Board (HESLB), which was accused of issuing loans to “ghost students” and underqualified students. A special audit, conducted by the Controller and Auditor General (CAG), found that TSh 23bn (£8m) in loans supposedly issued by the HESLB could not be accounted for. This includes loans issued to non-existent students, unrecorded repayments by former students, and accounts showing amounts owed by some students to be half the value of the loans issued. There are also cases of one student’s name appearing among loan beneficiaries in more than one institution of higher learning, and one bank account being used by more than one student to receive loans from HESLB, according to Minister Ndalichako. A total of 2,619 students with loans totalling TSh 14.4bn appeared to have used the same Form Four index number to receive the loans while with two different colleges, she said. She directed the board management to close the loopholes in the loans issuance and debt collection systems, and to provide an explanation on 168 suspected fake University of Dar es Salaam students who appeared to have received TSh 531.3m in loans and another 919 from the University of Dodoma who apparently received TSh 2.5bn. Both universities have reported that they had no record of the students. The audit also found serious weaknesses in HESLB’s procedures for recovering loans from graduated students. Over 100,000 students with loans taken out since 1994 have not begun to repay the loans. President Magufuli announced that the response to the abolishment of school fees had been a massive increase in enrolment, stating that pupil enrolment in Standard 1 has soared from 1,282,000 in 2015 to 1,896,584 pupils in 2016. He reiterated the government’s intention to offer free and quality education to all Tanzanian children, stressing that his administration would make sure that the goal is achieved. He made the announcement while handing over 60,000 desks to MPs, paid for by the National Assembly reducing its expenditure for four months. He also noted that the rise in enrolment raised new challenges for the sector, notably a shortage of 1,400,000 desks, as well as shortages of classrooms and staff houses. “It is quite clear that there are many challenges facing the education sector. We are doing everything in our power to resolve them,” he said. A new study found that basic Kiswahili literacy among Standard 2 and 3 primary school pupils has improved over the last three years. A pre­liminary report of the National Early Grade Reading Assessment found that targets set for 2015 under the “Big Results Now” initiative had been “met and surpassed”. The aim was to reduce the number of pupils scoring zero on word read­ing to 26%, and this target was exceeded with only 18% scoring zero in the recent tests. On oral reading fluency, only 16% of pupils scored zero, significantly better than the target of 26%. Similarly, in reading comprehension, only 26% scored zero against the 37% target.